blog a dome at your venue? a dome at your venue? Yes, it’s affordable – and it makes for a great addition for that empty space in your building. A way to provide something new for your visitors. We recently installed a planetarium type dome, and since this was a new device to us, we set it up in our shop to get familiar with it, and did some prep work before installing it at the client’s venue. We liked the product that we found so much, that we actually decided to take it on and we now represent Fulldome Pro, a product line that produces a great result for a reasonable budget. 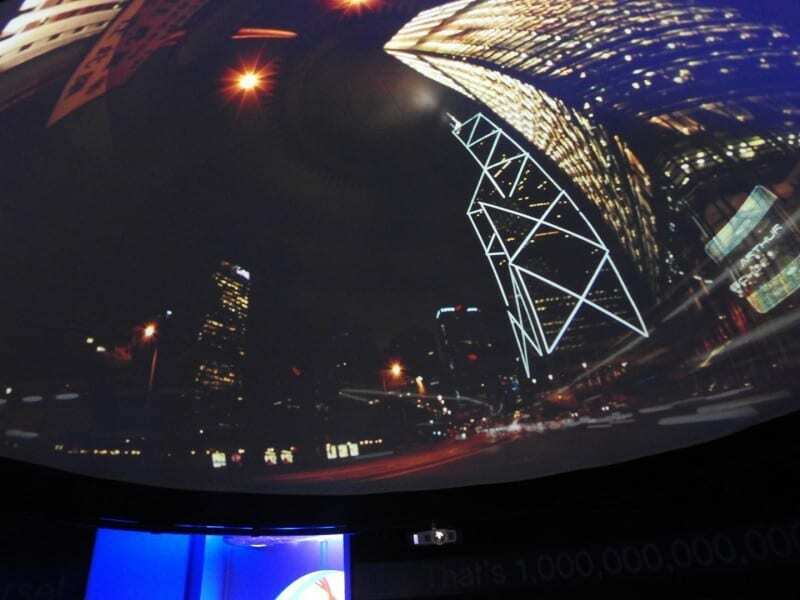 Suitable for planetarium type presentations, this dome can also be used for a host of other purposes too. Custom movies to show the life on top of an aircraft carrier, the view from one of the Blue Angel’s cockpits, a diver’s perspective of the ocean around them, or the day in the life of a desert tortoise as part of an ecology lesson. Don’t just think of the dome suspended above – it can be tilted too, and in that setting could be the view out of a submarine, or it can be used to allow your visitors to fly a flight simulator. Set it up for a 360 degree view of your gaming software. The dome can be raised, and the larger ones could be close to the ground. Events, product launches – possibilities are endless. And one of the good things is that existing 4k material can be converted to be shown in the dome, so more and more material on a host of subjects is easily available. We can also help with putting together a custom movie, or a semi-custom movie based on existing off the shelf footage together for your dome. 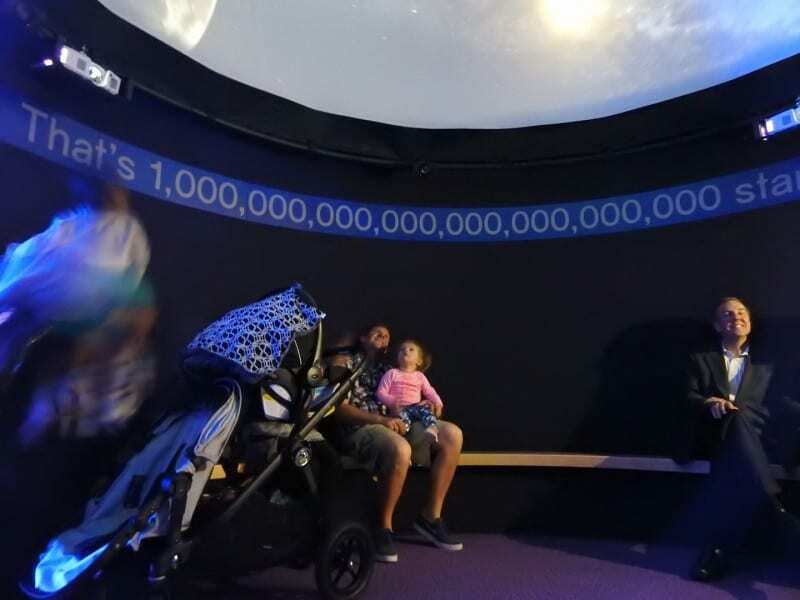 Planetarium domes are usually very expensive devices, that require special buildings, and beautiful optical instruments or projectors that are mounted in the center of the room – well outside the budget and scope of most smaller and medium sized museums. These domes are different: not only is the budget quite manageable for most museums, there is also no need to obscure the center of the floor space inside of the dome, as the projection system comprises multiple small projectors that are mounted on the edge of the dome. This means that the center of the space does not need to have any equipment in it, which in turn makes for a much more viable smaller dome system. 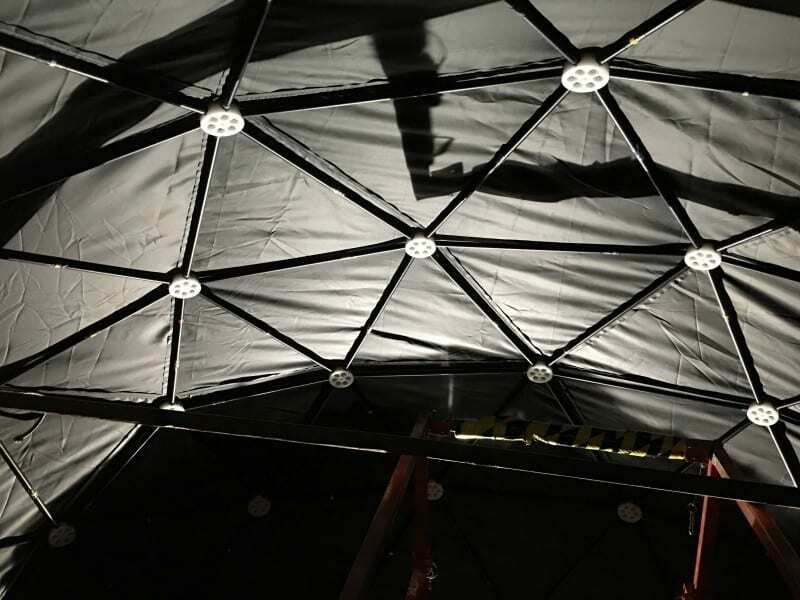 From 10′ diameter to over 100′ – these domes are great for planetarium shows, movies, gaming, special event spaces, and I’m sure a whole host of other applications that have not even been explored yet. Static or dynamic seating, special effects – all of the options are of course available. Even tilting the dome is an option. What is special about the Fulldome Pro dome is that it is a negative pressure dome – this means that it is a lightweight, easy to install solution that doesn’t need a lot of supporting infra-structure.. in fact, it is quite possible to install it without any external infra-structure or support other than power in the middle of an open space within your museum. First of all, we set up a frame to support the dome. Then a geodesic dome structure is built from a kit of parts specifically designed for the given dome size. A fabric outer is then mounted over the top of the structure, and the screen is mounted to the inside and connected to the outer structure. This image shows the inside of the geodesic structure before the screen is attached to the inside – not something you’ll ever see during normal operation. A small and impressively quiet fan is used to remove the air between the outer fabric and the inner screen, and the screen is pulled up to provide a beautiful dome-shaped projection surface. Multiple projectors and a great 5.1 audio system now provide an option for great shows or a fantastic gaming experience. Of course the system comes with a host of different movies, and custom movies can be produced – in fact, if you already have something in a suitable format that you’d like to show in the dome it is possible to convert your media so that it can be displayed in the dome. As for controlling it – it really doesn’t get a lot easier. An iPad mini, supplied as part of the system, is all you need for basic operation of the dome – and it’s easy. Adding the planetarium option, Event Horizon, an optional planetarium software solution provides for a great teaching tool, or you can use any of the ‘usual’ planetarium software such as (the free) Worldwide Telescope and similar. Interested? Give us a call to talk about it – you’ll be surprised at the low cost for these domes, and the amazing level of interest from your visitors.